Betting software Natipuj is designed for fans of football games betting. Based on a unique mathematical and statistical algorithms it can predict the probability of win - draw – lose or number of goals of the upcoming football match. The program offers features such as Tip for today, Tips for a week, Value tips or bets results of selected leagues for a few days ahead. More than 100 000 results of the top European leagues are stored in database. Currently there are 20 football leagues in program. The result database is daily updated, so it is ensured that the program offers the most accurate tips. The algorithm of calculations is based on the ELO system of performance evaluation of each team, just as in evaluating the performance of chess players. This system is more objective than traditional points and score. Our algorithm is enhanced with other factors such as the condition of a team, mutual matches, scores – divided into home – away - together. How does the computational algorithm work ? Abbreviation ELO is primarily known to chessplayer. It is a measure of performance based on the amount and quality of the meetings played. Simply put, if Team A wins over Team B, which is a performance leader, team A gets more ELO points, as it would get for the win over the worst team. The amount of points is determined by a formula, where the entry are ELO points of team A, B, and outcome. The formula is also determined by coefficient - in this case the difference in score is used. Certainly, the situation is different when someone wins 1:0 or 4:0. In practical terms, if Norwich wins over Chelsea 4:0, they get more points than if they win 1:0, but still more points than if they win 2:0 over Luton. It may happen that sometimes team gets more points for a draw with a leading team, than for a win over team from the bottom of a chart. The main difference here is that in the classic charts team gets a three points for a victory, but ELO charts distinguishes "who won over who". There is also distinguished ELO home and away, but the overall ELO is certainly not a sum! At the beginning of the competition each team will be assigned the same value of ELO points - 1500. Statistics was prepared to 17.12.2013, under the mode FULL MATCH, at single tips, double tips and triple tips. How are tips generated ? The biggest attraction of the program is the tip section, which provides the percentage tends to win - draw - lose. Everything depends on the system of ELO points. Each match gets a certain amount of ELO points, which are generated as the difference between the total ELO points,difference between ELO home and ELO guest as well as the difference in physical conditions of the team. The formula also incorporates mutual matches as a coefficient. The very tip is generated according to the history of played games that had the same or approximately same condition as guessed match. Chart showing the ups and downs of a team performance is displayed on a well-aranged graph in the window with the match analysis. All the parameters which determines the tip are at the bottom. There are also links to the last matches of teams, tables as well as mutual matches. So far, the highest presumption for the home team winning the match was in the match on 29.11.2003 Celtic FC - Partick Thistle (3:1) and the highest presumption for the guest team winning the match was on 26.03.2006 Livingston FC - Celtic FC (0:2). The program also has two user-favorite features "Tip for today" and "Tips for the week." Tip for today shows a match from complete offer of matches played that day, which has the highest prospect of concrete results. Tips for the week shows the entire offer of matches in the current week sorted by the highest prospect fo a particular result. Value tips search feature differences between odd and the percentage estimate for each available tip. A tip is generated as a single tip (1,0,2), double tip (10, 12, 01, 02, 21, 20) or triple tip (102, 120, 012, 021, 210, 201). The tips in a double or triple tip are ordered according to the probability of the result. 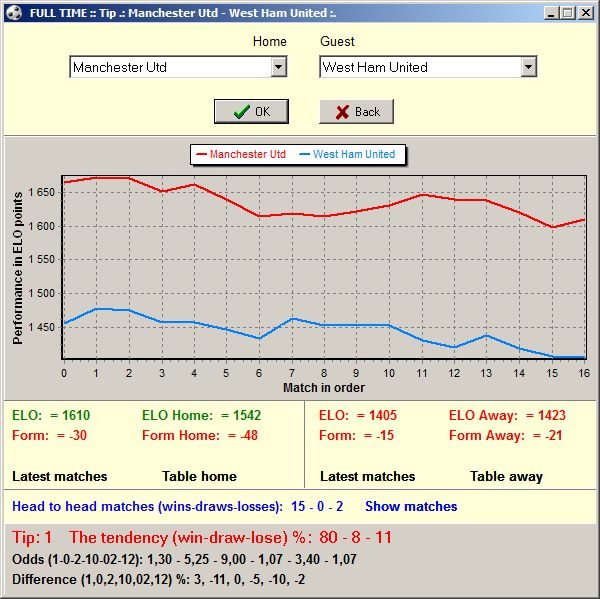 E. g. 10 means the victory of the home team with the back up of a draw, which means that the probability of the victory of the home team is higher than that of a draw. E. g. 21 means the victory of the guest team with the back up of the victory of the home team, which means that the victory of the guests has a higher probability than that of the home team. The order with triple tips is the same, only the probabilities are so close that the match can end with whatever result.